A police force is to offer drink and urine testing kits to clubbers who think their drinks have been spiked. Devon and Cornwall Police are working with venues across Plymouth to tackle the "growing issue of drink spiking". Revellers can ask staff to test their drinks at the bar and if anything shows up officers will be able to provide a urine testing kit. The force hopes that the three-month pilot scheme will be rolled out across the country if it is successful. Drink spiking was reported in Devon and Cornwall 89 times in 2018, 79 times in 2017, 39 times in 2016 and four times in 2015. Sgt Dave Moore said the new tests "will give us an indication very, very quickly as to whether or not someone has something either in their drink or in their system". He added that the kits could test for 11 of the most common types of drugs used to spike drinks in five minutes. If a drink was found to contain a dangerous substance, bar staff would take the customer to a safe place and call the police to secure further samples and evidence. CCTV and witnesses would then be sought as quickly as possible in order to try to locate the suspect and prevent further incidents from taking place. The initial test period will last for three months and it will run from 19 March to 2 June. Drinkaware said it was "difficult to know the true extent" of drink spiking. The charity said symptoms of being spiked include lowered inhibitions, loss of balance, visual problems, confusion and vomiting. A conviction for spiking someone's drink can result in a maximum of 10 years in prison. 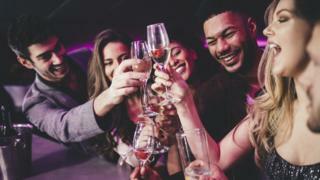 Across the UK, reports of drink spiking have more than doubled since 2015, figures obtained by Freedom of Information requests by Sky News show. "There are hundreds of reports of people having their drink spiked every year in the UK, but we think that's just the tip of the iceberg," Dr Sarah Jarvis, Drinkaware's medical advisor, said. "We know that a huge number of people are probably not coming forward, either because they're embarrassed or because some of these drugs can cause amnesia so you don't actually know what's happened or that you've had your drink spiked."